Time to sell your Club Cabana condo? Read about today's resort-market condo buyer. 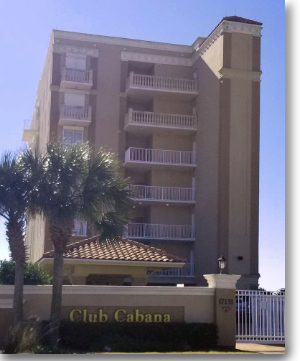 Club Cabana condominium in Perdido Key, Florida is located a little over two miles east of the Perdido Pass Bridge connecting Perdido Key to Orange Beach, Alabama. Club Cabana is a very low-density condominium with only twelve total condos built in 2001. The floor plans for Club Cabana are approximately 2,300 square foot four-bedroom condos with three bathrooms. Amenities for Club Cabana include a common lobby, gulf-front pool, exercise room, meeting room, and a steam room/sauna. Please let us know if you would like further info for Club Cabana or any other condos, homes, or real estate along the Gulf Coast or would like to schedule a private viewing by emailing info@condoinvestment.com or by calling (251) Area-Pro (251-273-2776) for immediate assistance.